For more than 15 years, the Cowboy Junkies  those singing siblings of sorrow  have been pioneering a bluesy-country-rock hybrid that addresses lifes tougher moments with unique clarity. Their songs are often filled with sad, introspective lyrics that stare into an emotional abyss. Yet, the groups chief songwriter, Michael Timmins, doesnt fall into the self-pitying trap. His lyrics are melancholy and sometimes angry, but not whiny or self-righteous. 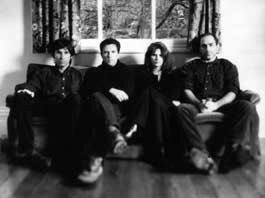 Formed in 1984, the Cowboy Junkies started out as a quintet featuring siblings Michael, Margo, Peter, rhythm guitarist John Timmins and their bass-playing friend Alan Anton. Though they loved punk rock as kids and were fiercely independent, the group was essentially a cover act. Six months into the project, John left. Headlined by Margos soft, hypnotic voice, that open, almost minimalist sound became the groups calling card, and the surreal, spiritual effect helped them build a cult following. The Canadian quartet released their first album, White, on their own label in 1986. Consisting of mostly old blues tunes, it was a good debut. But their next album put them on the map. In 1988, the Junkies went into an abandoned church and recorded a dozen tunes directly to two-track tape. Dubbed The Trinity Session, the mix of originals, country and rock standards was released on their own label. Critics fawned over the quiet disc, which posted sales figures that were impressive enough for RCA to take notice. The label signed the group and picked up the album, which eventually went platinum. With major label backing, the quartet had a bigger production budget and could explore more dynamic areas. Michael Timmins wrote more material, sometimes penning entire albums. He emerged as a vivid storyteller, while Margo gave the characters and images dimension. He continued to focus on that somber sound, but expanded his sonic palette by adding some edge with heavy distortion and feedback. Margo pushed her own envelope as she became more confident, while the rhythm section evolved and started bringing in different textures. But the songs remained deliberately unhurried. Even when they kicked things up a couple notches, the band never sacrificed its mesmerizing effect. After five albums with RCA, the quartet moved over to Geffen and scored a hit in 1996 with Common Disaster from the Lay It Down album, which itself went gold. But the Geffen marriage was short-lived, as the label was soon swallowed up by Universal. Now Vivendi-Universal, the record company has earned a reputation for being very focused on the bottom line  even by record industry standards. The Junkies 100,000 to 150,000 sales per album, usually considered excellent by independent standards, was not enough. When Miles From Home was released in 1998, the new management thought the disc would fail, so they didnt support it  creating a self-fulfilling prophecy. The Junkies had other suitors when Geffen dropped them, but the band chose to go the independent route. Resurrecting their old label, they released two discs that are available only through the Internet. Last year they released Open, their first new studio album since Miles From Home, and worked out a distribution arrangement with Zoe Records for the album. Michael Timmins work on Open ranks him among this eras most compelling songwriters. Yes, his words are still sullen. But sonically and lyrically, his songs are also deeply personal and unusual. In fact, his younger sister considers his words hopeful, even if their subjects arent. Surviving never sounded so good.